An hour from Bonampak we reach the frontier town, Frontera Corozal. We descend across two springy, cablebound causeways to the banks of the Umumacinta River. The Umumacinta has been called the River of Ruins. 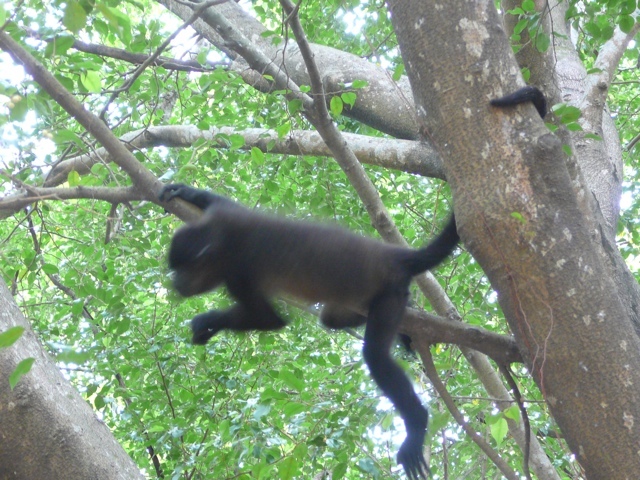 According to Dr. Alfonso Morales one of our guides, and one of Mexico’s great archaeologists, Umumacinta can be translated as River of Howler Monkeys. Howlers roar so loud you expect them to be ten times their actual size. When they burst out of the jungle, one is relieved that they are gangly black haired creatures not much larger than chimps. It would be a mistake to get to close though, they enjoy flinging feces at visitors. 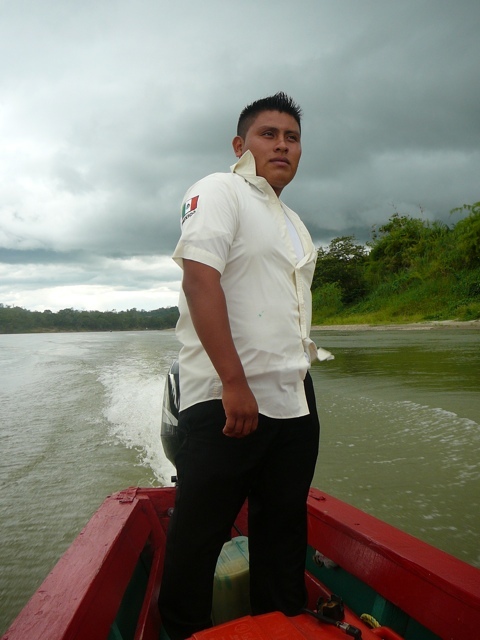 At the river bank we are met by Ch’ol Maya boatman who pilot launches upriver to Yaxchilan. The launches are narrow boats, perhaps 35 feet long, powered by a single outboard motor. Nine others are already on the boat. The moment I step aboard our pilot pushes off, drops the propellor into the river and we are off. After a long bus ride from Palenque we are giddy to be on the river. As we head upriver the pilot stands erect gazing over our heads. He sees things we can’t, plotting a course that moves us rapidly forward. Sometimes we come quite close to the right bank, the starboard side. The two banks look the same, but one side is Guatemala. This right bank is part of the northernmost area of Guatemala, the territory known as the Peten. A few weeks back there was a massacre in the Peten. According to press reports the Zeta drug cartel murdered 30 Guatemalan farmers, and painted messages in blood on the cinderblock walls of the village. On the Guatemalan side I notice crude shelters, palm frond lean-tos. These might be picnic grounds, but more likely a final shelter before migrants attempt the crossing into Mexico. Yaxchilan has a remarkable ancient ballcourt, I will get to it in a future post. Next > Jan de Vos: In the flesh.